The trip from Dallas back to Route 66 on October 11, 2016, took us through field after field of cotton. They were in all stages of growth. 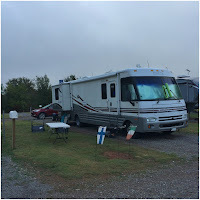 Bobcat Creek RV Park, right on the route, was home for the week. 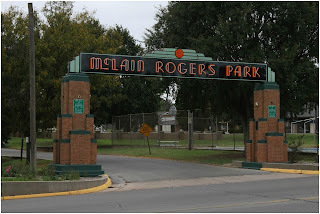 It is a fairly small park with pull through and back in sites. All are gravel with grass and fairly level. The young couple who own it are working hard to improve it, they spent all week upgrading the electric on one row of sites. 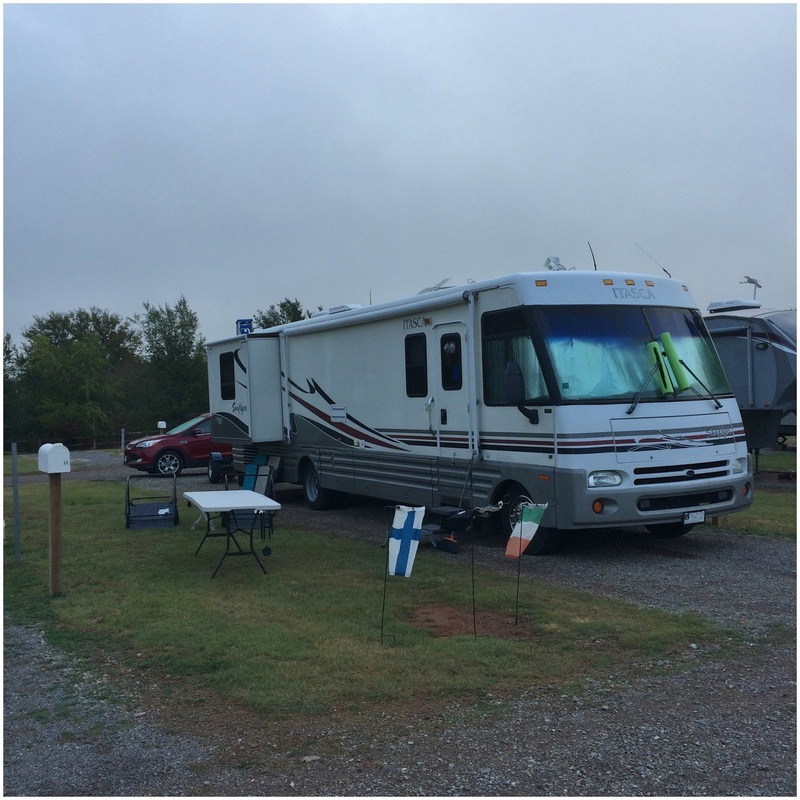 Even though we were just off of Route 66 and I-40 it is quiet as the park is set back from the roads. 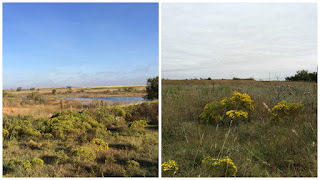 The campground is surrounded by fields, found a great spot to run Mielikki off lead. 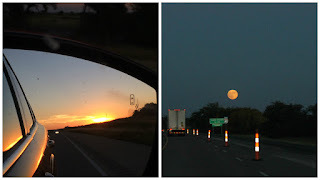 We picked the route back up in Oklahoma City where we left off last time and took it all the way to Abilene, TX. 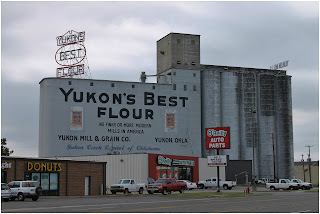 First up was Yukon, OK, while there is not much from the old route left, there is this cool sign on the side of a mill for Yukon Flour. El Reno, Ok is just down the road. 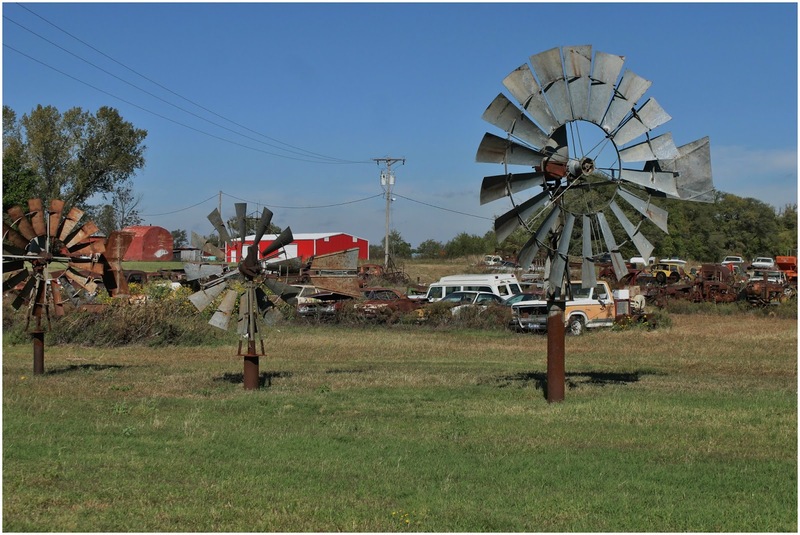 It was once a thriving railroad town but now it is mostly just a farming community. The eastern edge of the town was part of the land run in 1889. We stopped for lunch for at Sid's Diner. They have been serving up food for locals and tourist for 28 years. The most popular item, and the one we both got, is their Onion Burger. A true authentic Oklahoma experience. 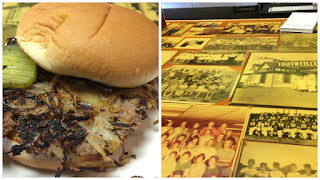 During the Depression, onions were cut into thin ribbons and then grilled into the hamburgers to help stretch the meat. People found they liked the burgers better this way and the practice continues. We certainly understand why - they were exceptionally good. 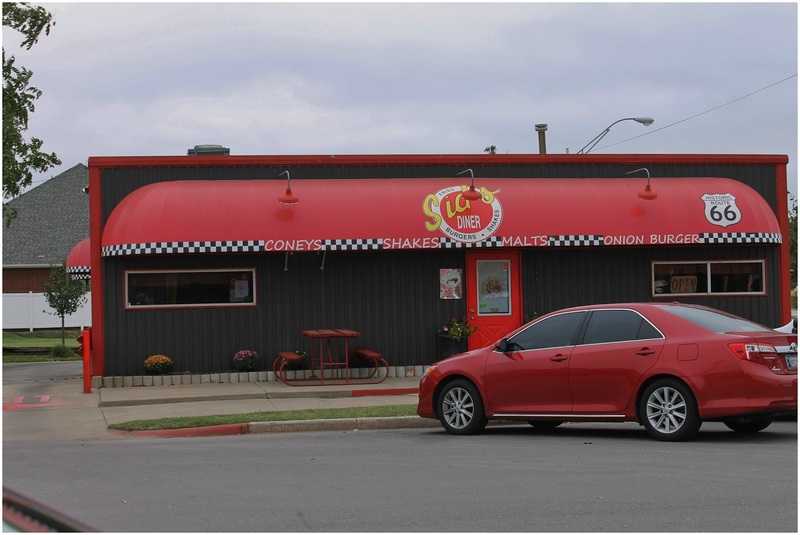 The place is very small with counter service and four tables. 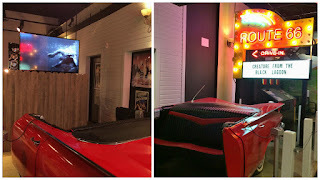 It is decorated with photos and memorabilia. 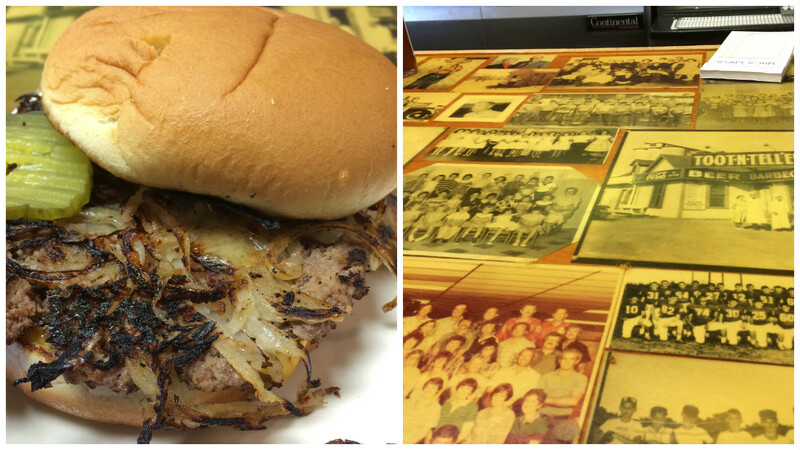 The counter and table tops are covered in old photos. On the way to Hydro we crossed the William H Murray Bridge, or as the locals call it the "Pony Bridge". 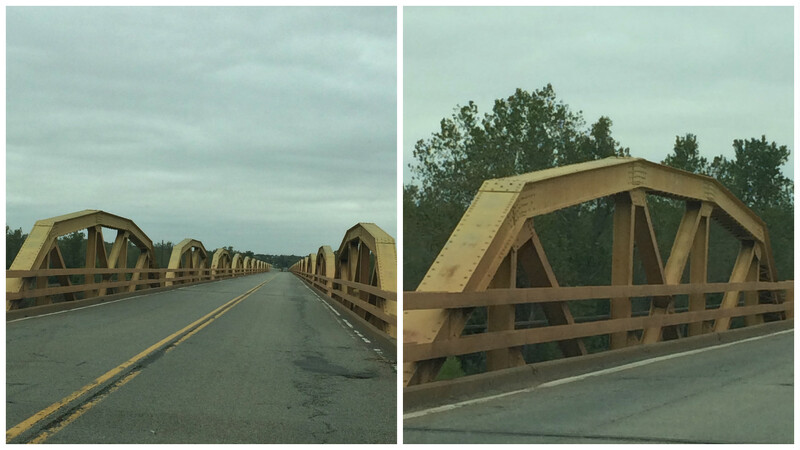 It was built in 1933 and is the longest truss bridge on Route 66 with a span of almost 4,000-feet. It has 38 pony trusses, hence the nick name, each is 100-feet long. At the time it was an engineering marvel. 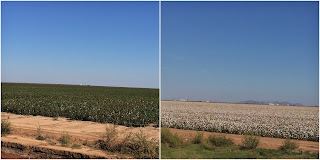 A scene from the "Grapes of Wrath" was shot here. 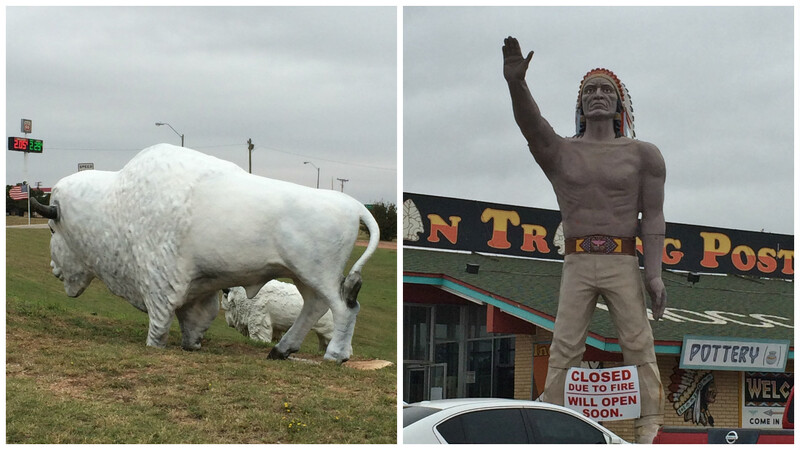 We also got a picture of the Indian Muffler Man, he stands outside the Indian Trading Post watching over the buffalo. 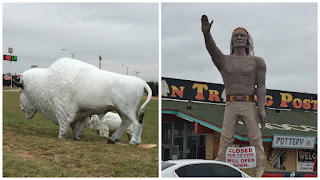 In Hydro, OK we stopped at the Nutopia Nut's 'N More store, they have been providing road munchies since 1942. Lucille's Service Station, built in 1929 is just outside of Hydro. 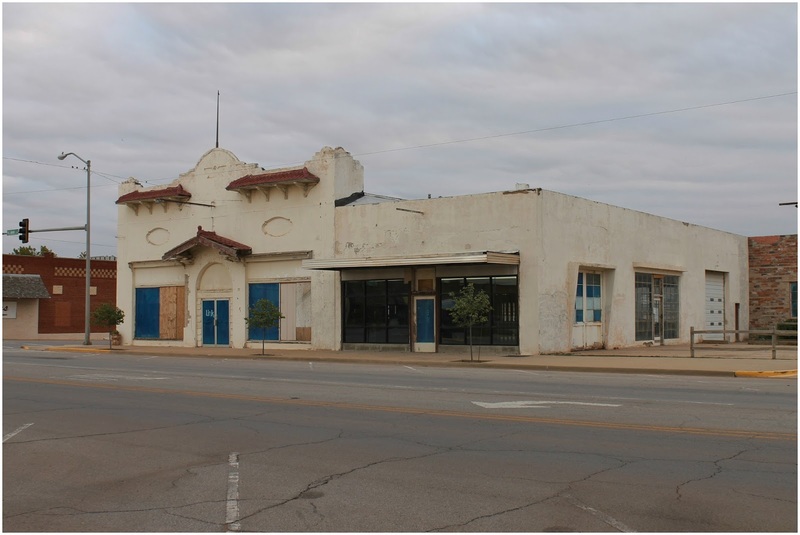 The two-story building is one of only two like it on the route in Oklahoma. 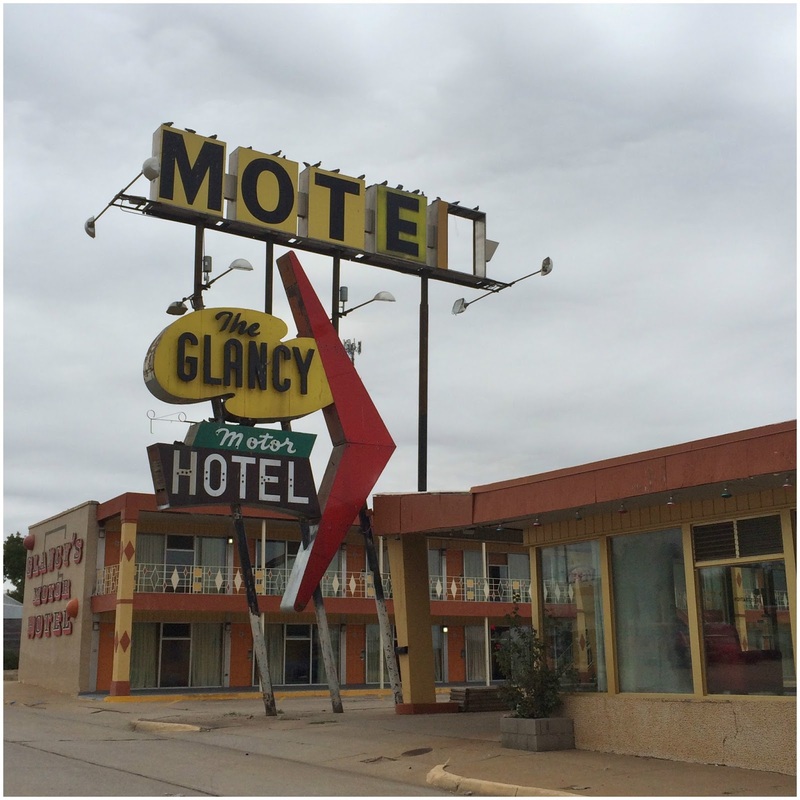 In 1941 Lucille Hammons and her husband bought the business and it was a celebrated stop for Route 66 travelers. Lucille worked seven days a week for 59 years running the place until her death in 2000. Many people called her the Mother of the Mother Road. 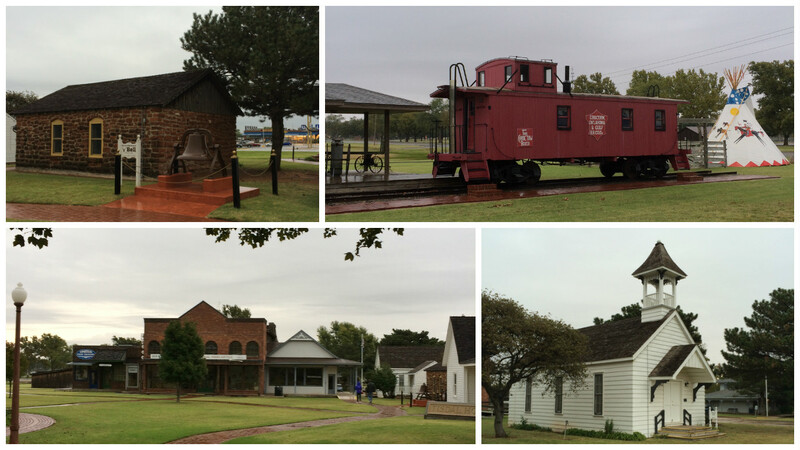 The route takes you through Weatherford, OK next. The Stafford Air and Space Museum and the Heartland of America Museum are here. Both were closed when we went through. 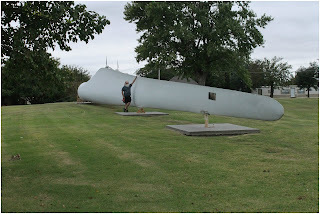 The town has one of the largest wind farms in the state and the Wind and Energy Center has a turbine blade laid out on it's property. Those things are huge! 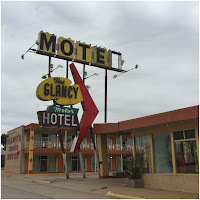 As we rolled through Clinton we snapped a picture of the Glancy Motel sign. The McLain Rogers Park sits on 12-acres and was a popular spot for travelers in the '30's and '40's, as a picnic stop as well as enjoying the Olympic sized pool. The entrance gate is a great example of the prosperous times this city once enjoyed. 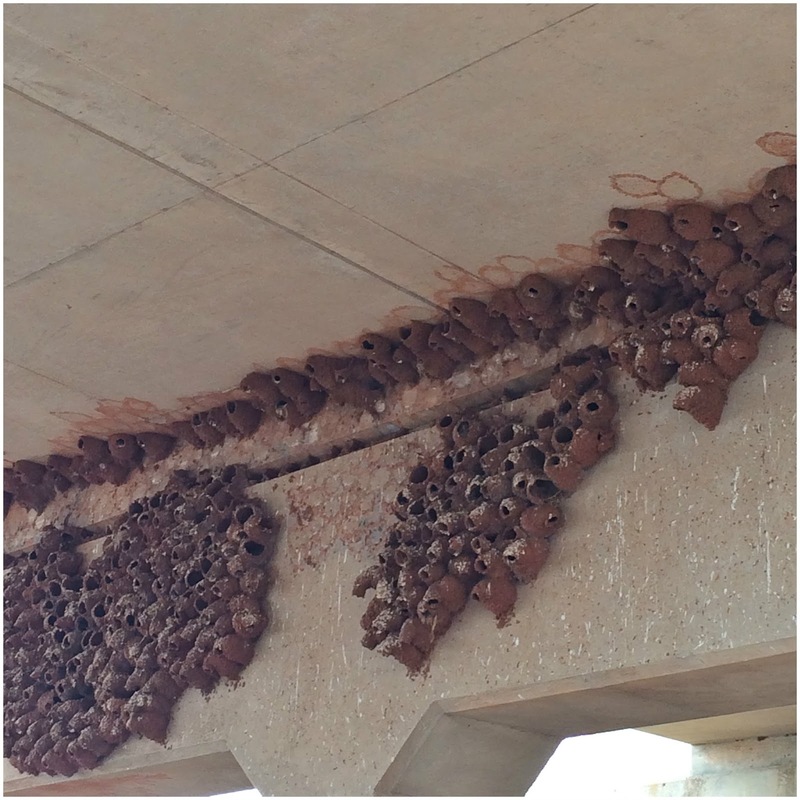 As we drove under an overpass on the way to Canute we found these bird nests. There were 100's of them on both sides of the road. It was so cool. 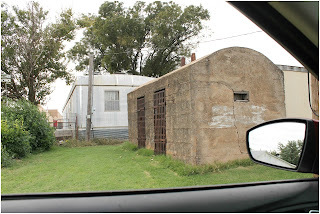 We also came across what was probably an old gas station or store. 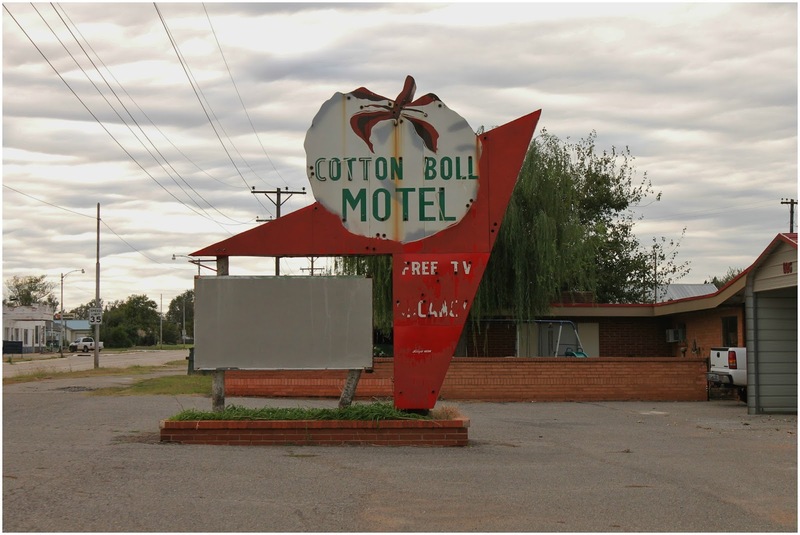 There is not much left in Canute, OK. We got a picture of the Cotton Bowl Motel sign. This 1930's Canute Service Station sits empty these days. 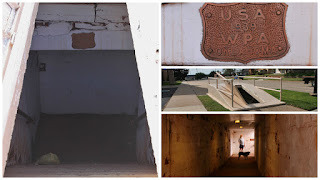 The first Oklahoma State Park was built here by the Works Progress Program, today it is a small city park. There is also an old stone building that served as the towns jail. The picture is not great because as we drove down the alley to find it, every house we passed had very unhappy dogs around them, so we snapped and ran. Elk City, OK is one of the bigger towns on the route. 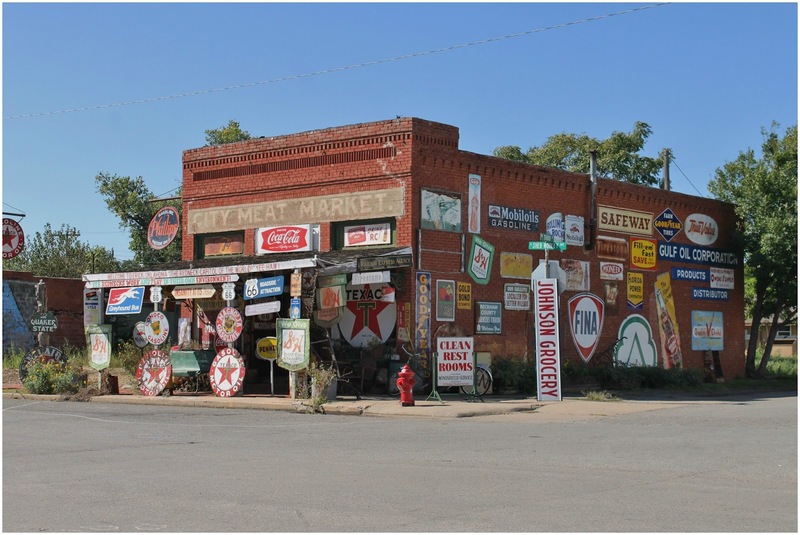 I-40 runs through town which has helped it to survive and grow. 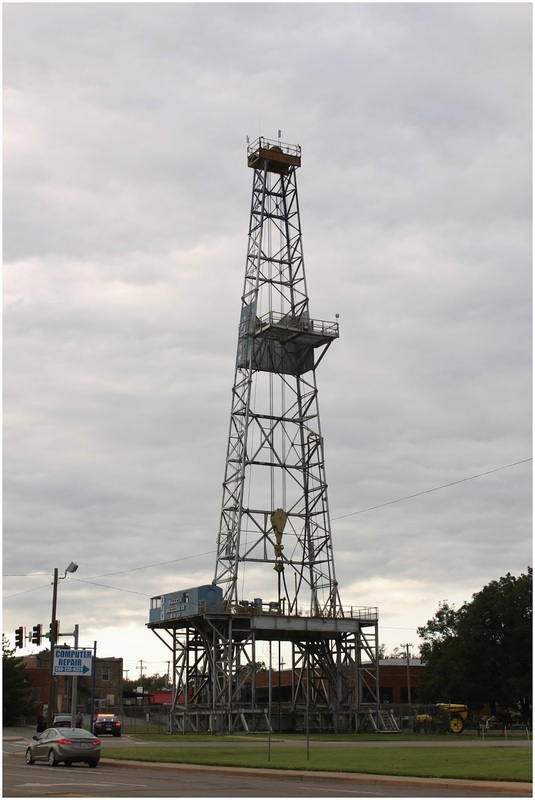 As you come into town from the east side you can't miss the Parker Drilling Rig. At 179-feet (about the height of a 22-story building) it's hard to miss. It is the worlds largest non-operating oil rig. It was built in the mid '60's to drill shafts in order to test-detonate atomic bombs underground, it was later used for oil and gas drilling. 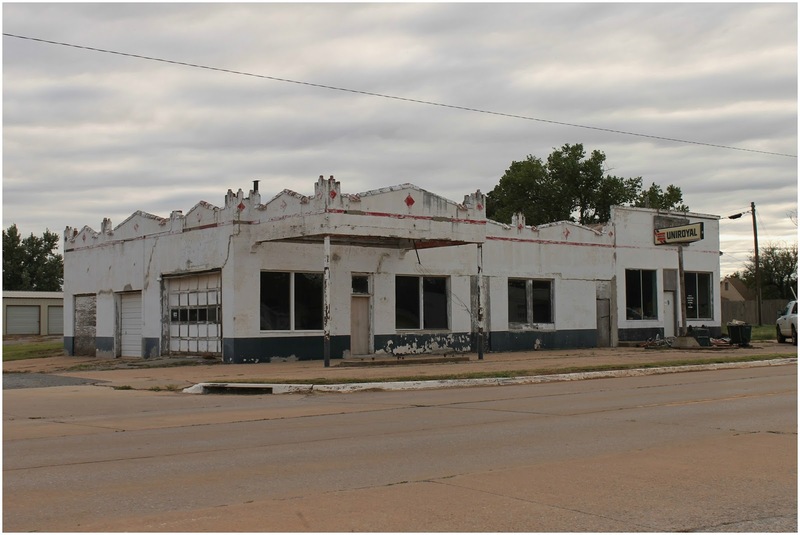 This 1918 building was the home to the Hedlund Motor Company, which opened in 1913 and moved to this location after construction was done. 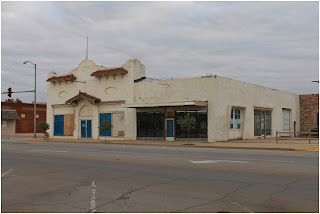 It is the second oldest Ford dealership in Oklahoma. 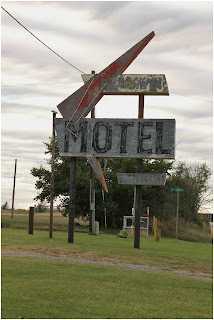 There is nothing left of the Washita Motel except the sign. 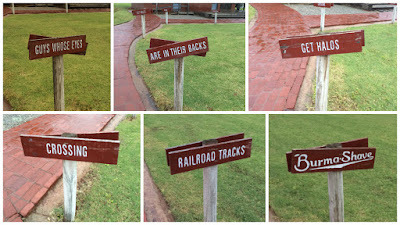 We stopped at the Elk City Historical and Route 66 Museum. It is set up like a small village, with the first two buildings dedicated to Route 66 and transportation. 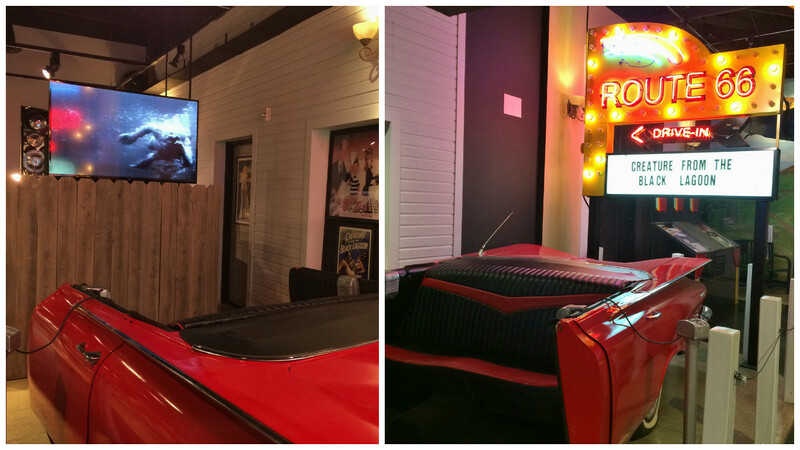 They have portions of cars that you can sit in to watch videos and old movie clips. 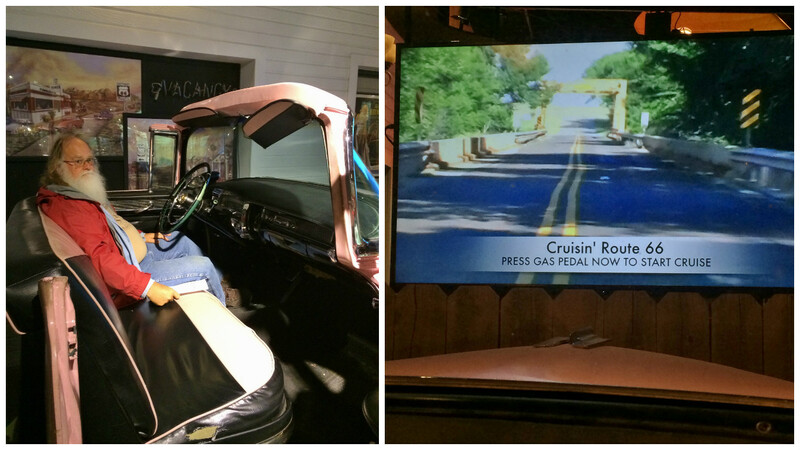 The front of a pink Cadillac and the back of a red Cadillac. The old movie clips were from "The Creature From the Black Lagoon" and "The Blob". 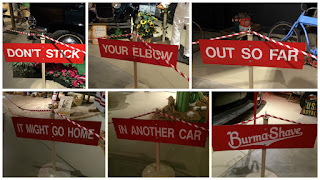 There is a walk-through museum with little vignettes of the route. 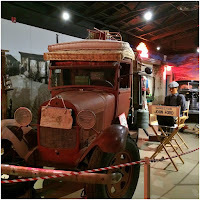 One was the filming of the "Grapes of Wrath". There are signs with Burma Shave sayings, one in the museum and the other on the grounds. The only building you can get into on the grounds is the Bruening House. 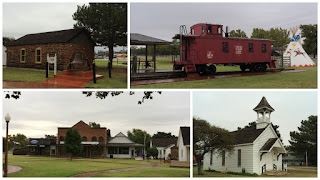 It is filled with local history and the top floor is a rodeo museum, probably the only way we would go to rodeo museum! 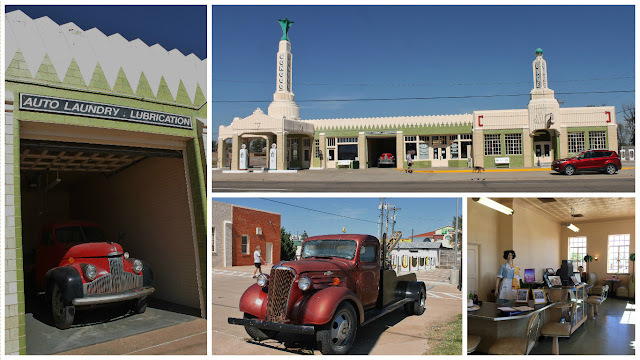 Sayre, OK where we stayed at is now just a small town but in the '30's there were 5 oil companies and a gasoline plant and they were a major shipping point for produce and livestock. There is a Pedestrian Tunnel in town, this one is not kept up like the one in Chelsea. The stairs were lined with trash and the paint is peeling badly. Today it is mostly used as a storm shelter. 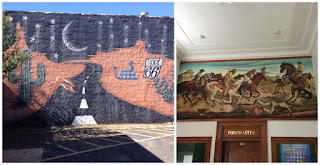 There are two murals in town, one of the land rush in the post office lobby and the other of the road. 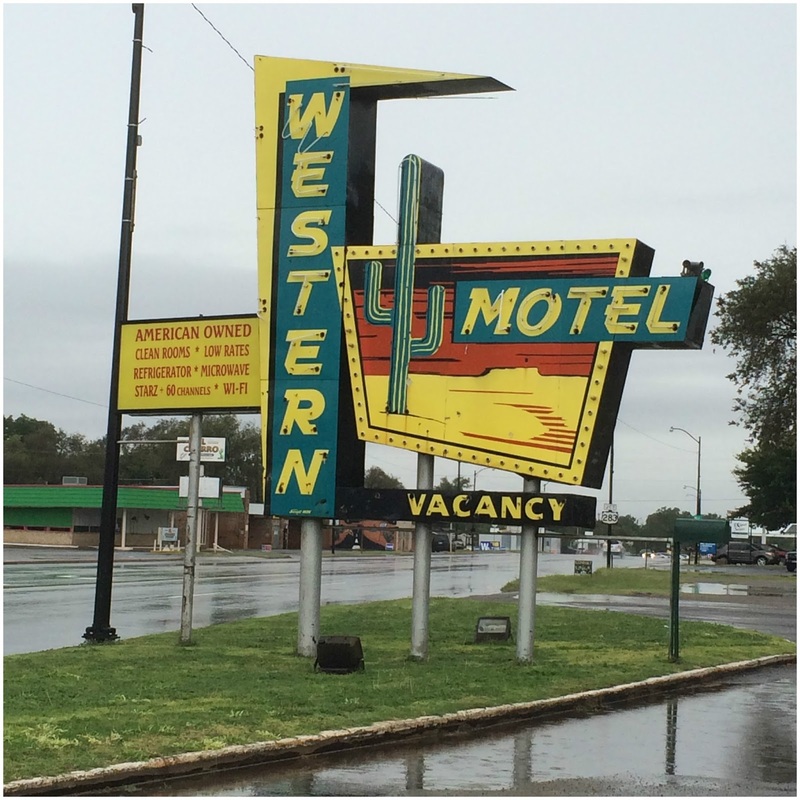 The Western Motel is still in operation today, although we only saw one car in the parking lot the whole time we were here. There are some cool old buildings in town. The Beckham County Courthouse was built in 1911 and is one of the few domed buildings in the state. 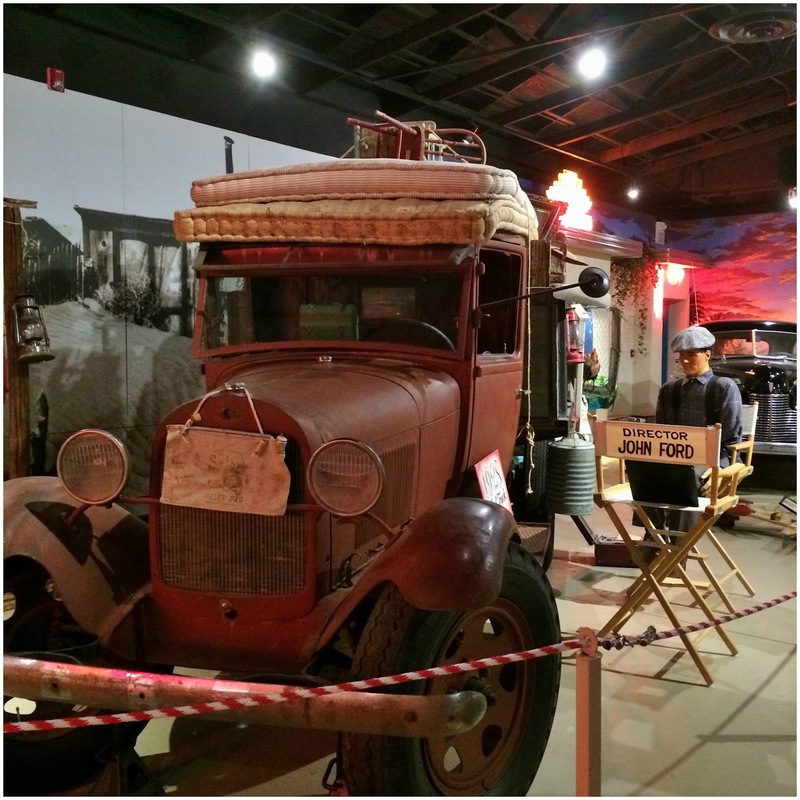 It also was featured in the move "Grapes of Wrath". The red stone pueblo-style pool house in Sayre Park was built in 1940 as part of the Works Progress Program. The First National Bank building is from 1905. 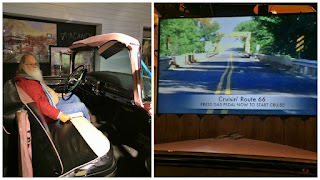 Erick, Ok is the birthplace of Roger Miller, just about everyone knows his most famous song, "King of the Road". There is a museum dedicated to him here, but not much else. 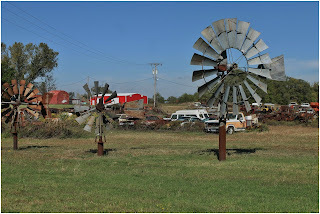 As you come into town from the east side you pass a house that has a Windmill and Car Graveyard. Would love to wander though those cars. Annabelle and Harley Russel had a wacky music act called "Mediocre Music Makers", they wrote over 300 songs and would perform for anyone who stopped in. Both have now passed and the store is closed, but the outside is still covered in signs. 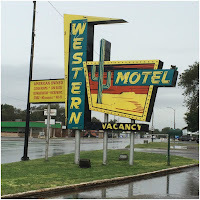 The old Westwinds Motel is another one that had carports for each room. The Elm Motel has seen better days but it is still in operation either as a motel or apartments we couldn't tell. Texola, OK is the last town before you hit Texas. 1910 census showed 361 people lived here, in 2013 the population was estimated at 38. Mostly abandoned houses and buildings. There is one store left and a great sign just before you leave town. 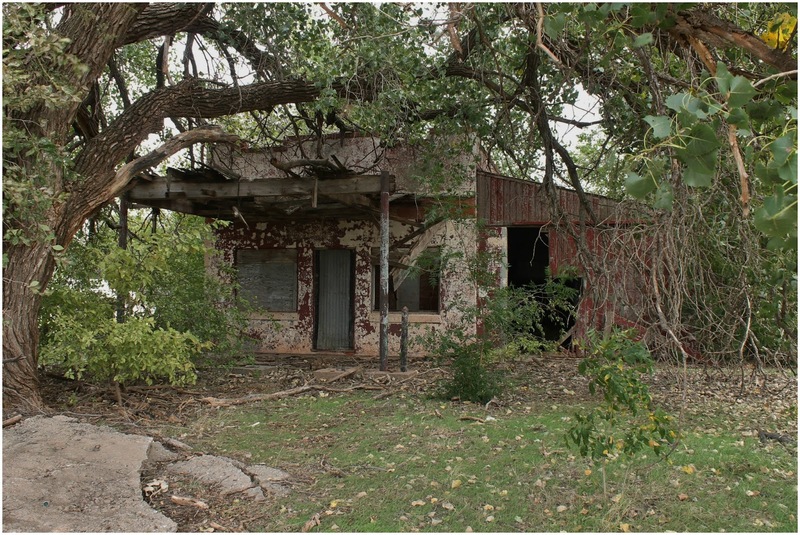 Shamrock is the first town in Texas. There is the beautiful Tower Conoco Station and U Drop Inn Cafe building. It is now the visitor center/museum. It was built in 1936 and was the first commercial business on the route when it came through town. It was the only cafe within 100 miles. There is also an old Magnolia Gas Station, in Shamrock. The Devils Rope Museum is in McLean, TX, dedicated to barbwire, not really are thing we so passed on this one. 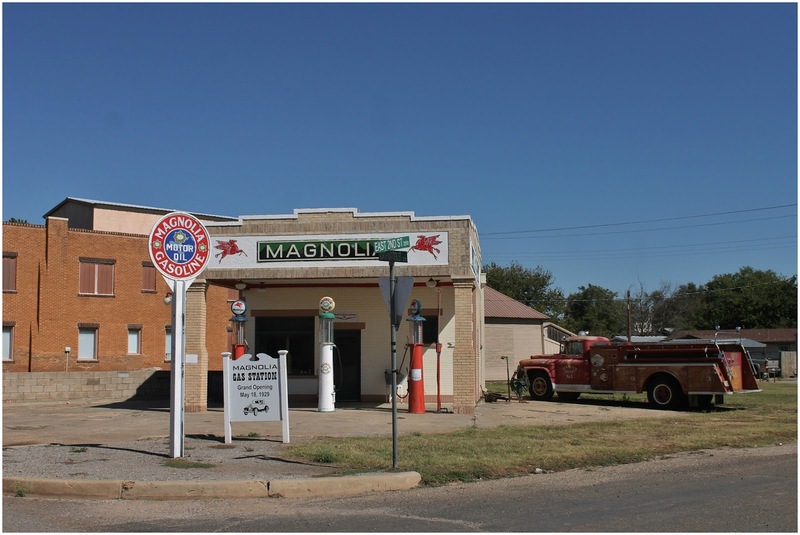 There is an adorable Phillips Gas Station. Nancy thinks it would make a wonderful art studio. There is not much left in Groom except grain elevators and an inspirational rest stop with a Giant Cross. The biggest attraction is the leaning water tower. 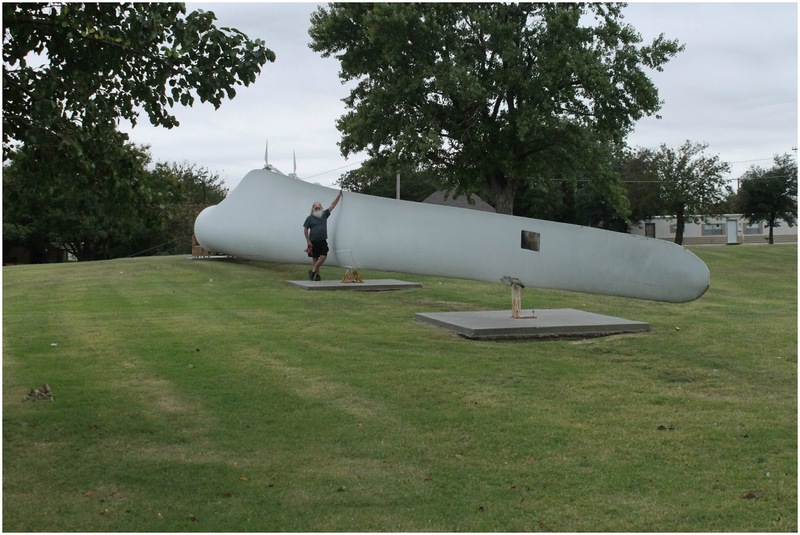 Ralph Britten, an Army Air Corp engineer, bought this tower and placed it here in 1980 as a joke. It looks like it is about to fall over but it is actually secure on tri-pod legs and only leans 10% but our eyes fool us into thinking it leans more. 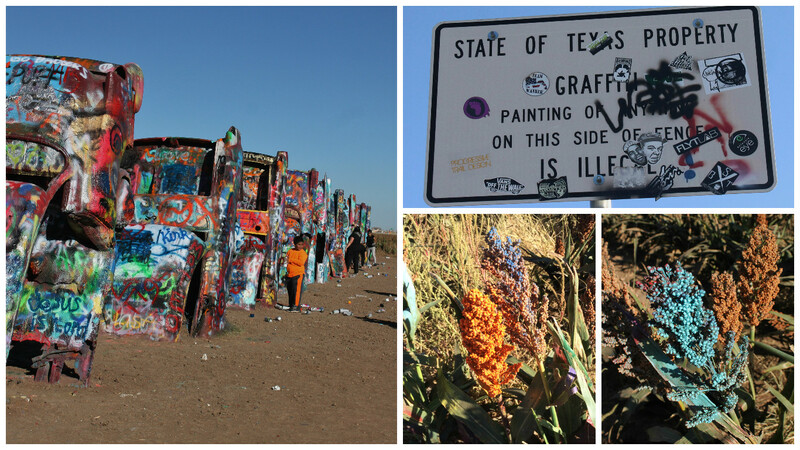 If it wasn't for the VW Bug Ranch, you might miss Conway as you drive through it. Just out side of Conway is the Stoner Patriot Peace Park. An interesting mix of peace symbols, military memorials, and religious symbols. 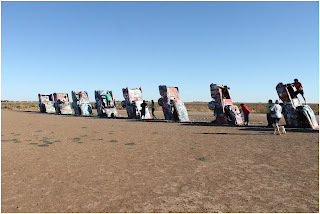 Amarillo, TX has some of the craziest roads we have seen. There is a section of four one-way roads that alternate in direction and take you in and out of downtown. We were there on a Saturday, so downtown was pretty quite. 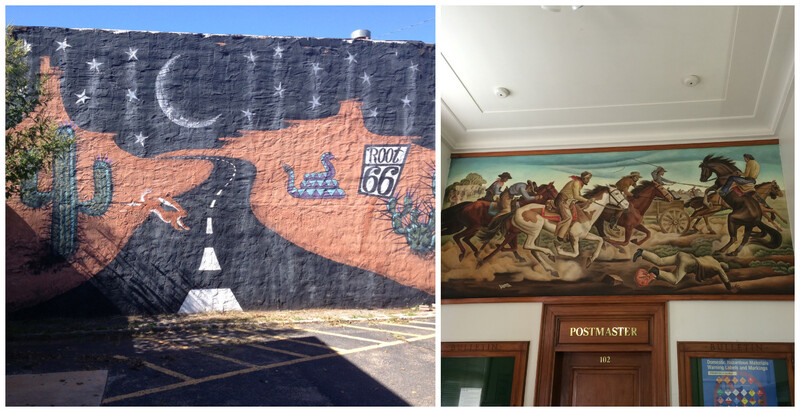 The section of town that Route 66 went through is called the 6th Street Historic District. It is a popular area today, with restaurants, bars and shops. 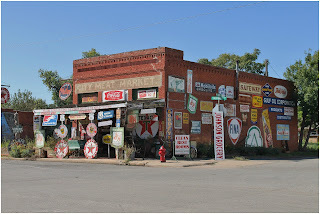 Not much left from back in the day, a few gas stations, most are used car lots so getting a picture was difficult. The one we got is the Adkinson-Baker Tire Co, with its original canopy built in the early '30's. Campground which is where we found the Muffler Man. 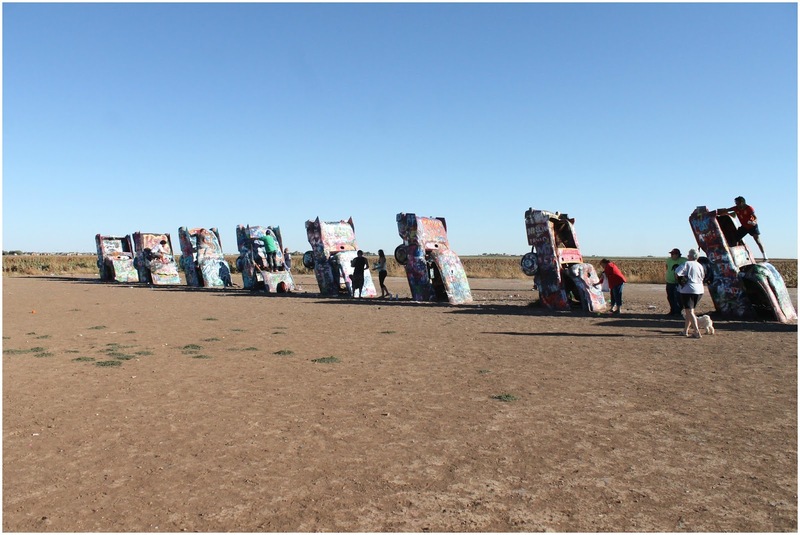 Cadillac Ranch is a row of Caddies planted into the ground in the middle of a Sorghum field. They are covered in layers of spray paint. The day we were there people where painting away. The ground is littered with paint cans both empty and full. Even some of surrounding plants got a coat. It seems that people don't pay attention to the sign outside the fence! Our drive home gave us both a beautiful sunset and a glorious full hunters moon. 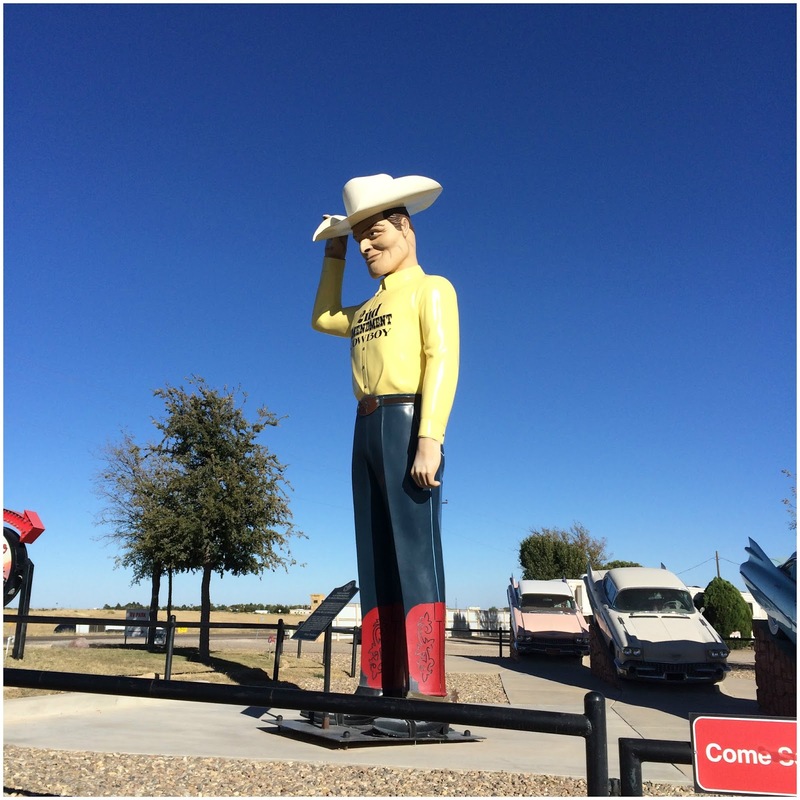 Next up is Tucumcari, NM. ~ Don't sweat the small stuff. This has become Nancy's mantra of late. She has a tendency to get herself all stressed out over getting the blog written in a timely matter. While she enjoys writing it, it can be very time consuming. Part of the process is editing all the 100's of pictures and getting them organized and labeled so they can be used here and referred to later. We would never remember where a picture was taken if they weren't labeled. So at the end of a long day of sightseeing she can spend 3 or 4 hours on the blog and pictures. Doesn't leave much down time. So from this point forward - there will still be blog posts but probably not every week if the visit has been jam packed. Taking the pressure (all self induced) off will allow her to enjoy doing it again. We are so grateful for everyone who follows along with us and we want to be able to continue to share our photos and adventures and keep smiling at the same time.